ADATA has formally introduced its first SSDs based on 3D NAND flash memory. The Ultimate SU800 drives are designed for price-conscious market segments and use SATA interface, which means that they do not offer very high performance. Nonetheless, usage of high-capacity 3D NAND chips helps the manufacturer to increase its MTBF rating and could eventually help ADATA to offer very competitive pricing for these drives. 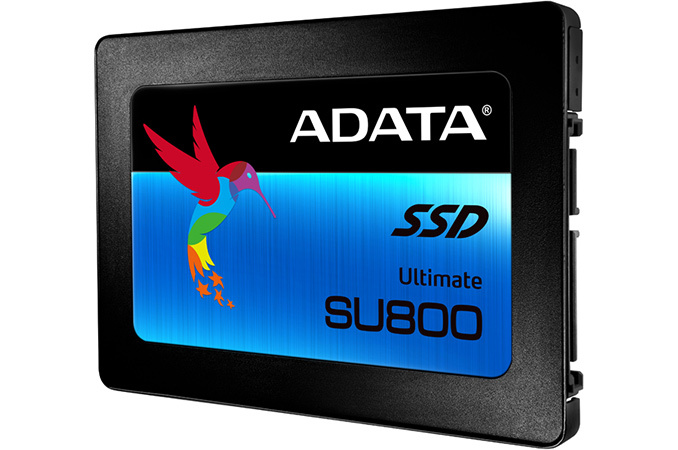 The family of ADATA’s Ultimate SU800 SSDs includes models with 128 GB, 256 GB, 512 GB and 1 TB capacity. The drives are based on Silicon Motion’s SM2258 controller (which has four NAND flash channels and LDPC ECC technology) as well as 3D TLC NAND flash memory from an unknown manufacturer (either IMFT or SK Hynix). The drives come in 2.5”/7 mm form-factor and use SATA 6 Gbps interface. The manufacturer claims that the Ultimate SU800 SSDs support sequential read performance up to 560 MB/s as well as sequential write performance up to 520 MB/s when pseudo-SLC caching is used. The 128 GB model is naturally slower than its brethren are when it comes to writing (up to 300 MB/s), but its read speed is in line with higher-capacity SKUs. ADATA did not mention random performance of the SSDs as well as their power consumption, but the SM2258 controller is capable of up to 90,000 read and up to 80,000 IOPS. Thanks to higher endurance of 3D TLC NAND compared to planar flash memory made using thin process technologies, ADATA declares 2 million hours MTBF and offers three-year limited warranty on its new SSDs. While the warranty is standard for modern solid-state drives, the MTBF rating 0.5 million hours higher compared to current-generation entry-level SSDs from the company. At present ADATA already has a number of affordable SATA SSDs (e.g., Premier SP550 and SP580) based on planar TLC NAND flash memory. The company specifically noted in its press released that the new Ultimate SU800 will be faster than its existing entry-level models (and will provide higher MTBF). As a result, the new SSDs will be positioned above the currently available inexpensive models. Now, about the retail pricing. ADATA plans to charge $60, $80, $140 and $270 for 128 GB, 256 GB, 512 GB and 1 TB versions of its Ultimate SU800 SSDs, but they are not the cheapest in the company’s model range (even though the price of the 256 GB SKU seems very competitive). Moreover, next month the company plans to introduce another family of 3D NAND-based drives (the Ultimate SU900) with higher performance. I'm not even a fan of Samsung SSD's (mostly sour over their poor handling of the 840 EVO bug) but you'd be crazy to get any crap from ADATA over something from Samsung. Figured I'd chime in on a recommendation too. Although the 850 EVO is pretty much in a class of its own, it's also in a price of its own. You can get the 750 EVO, practically the same performance, for a little less, or look into the OCZ Trion 150 or the Sandisk X400, both good quality reliable TLC drives. My overall recommendation, though, is to avoid TLC for a boot drive. It's just too inconsistent with the SLC cache algorithm, and really just makes sense for a storage drive. Good, inexpensive MLC drives can still be found incredibly cheap. Sandisk Ultra II, Crucial MX100/M500, and even the newegg exclusive Mushkin ECO2 (Sandforce 2281-based) are all discontinued but still available, and incredibly reliable. Or SSD Plus for that matter. Sandisk has some questionable naming schemes as well, but at least offers decent warranties, an SSD toolbox and in my experience above average reliability. The only SSD brand I've seen fail more than ADATA is OCZ, and we're talking 4-5 years ago OCZ. Since Barefoot surfaced and throughout the Toshiba takeover, I haven't seen a single OCZ SSD fail, which indicates improved binning, QC, validation, and interestingly, support. I believe they are the only company that offers a no questions asked advanced RMA. Not that I know anybody that's ever needed it. The SSD Plus isn't TLC. It is a recent economy MLC design (there are two versions, the old version was obviously MLC as well but with a different controller) based on a Silicon Motion controller. And no it isn't fast at writing because it is DRAMless so updating the indirection table has latency, but the firmware released early this year fixed the lag issues and most people noticed write performance go from the 200's to the high 300's. That thing can't be using micron's 3D TLC flash, because that uses 384Gbit dies, which means 128GB capacity point is near impossible. Yeah, I was wondering about that, either they are using a ton of overprovisioning, or they are not using 384gb dies. If they are using flash from IMFT and SK Hynix that would potentially mean that they are using dies with two different capacities? That wouldn't make sense. Does SK Hynix have a 384gb die or did they go 256/512 with their 3D TLC? I didn't even know SK Hynix was even shipping 3D NAND yet! What about toshiba?